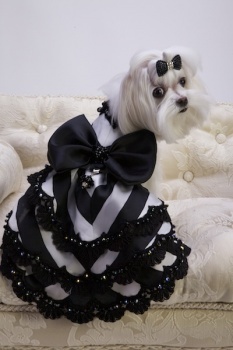 For the past ten years CHIEN COATURE has created stunning gowns, harnesses, coats, collars, leashes, sweaters, jewelry and hair bows for a special niche of small dogs. The NEW CHIEN COATURE provides original custom-designed ensembles unique to each client. The experience includes a fitting sample to ensure a perfect fit, a design sketch to convey the design idea and a beautiful end result. Only the finest materials and trims are used to create CHIEN COATURE original designs. Each piece is expertly hand-crafted in the United States. Please browse through our beautiful products and contact us to discuss a unique custom-designed CHIEN COATURE masterpiece for your special dog.